Today I thought I would share a little of my cooking wisdom. Well - truthfully - it originated with my mother-in-law. She is a smart cookie! For years she had her own catering business, and to this day she guards the secret to her famous rum/almond cake. So in honour of Mothers Day (belated) and her birthday (which was on the weekend ) I thought I would share some wisdom she has given me. When I was sitting down to work on a future blog (about certain foods I had hated and now love) I kept thinking about how I now LOVE plaintains. But, I couldn't work it into that blog - why? - because I had never known about plaintains til I got married. Whenever I had seen them - which wasn't often (hellooo, Canada isn't really known for tropical fruits) - I always chalked them up to weird bananas and went on my way. It wasn't until I married my Puerto Rican hubster that I was introduced to their deliciousness. 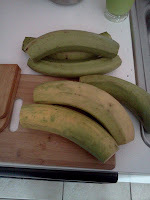 So how can I say I ever hated them... when there are days I have cravings that only sweet plantains (maduros) will fix. I am not sure how I lived before them. There are many ways to prepare plantains - green or sweet - but one of the favs around here tostones! This is when, traditionally - pieces (about an inch to an inch and a half) are fried, flattened, then refried - making a crispy disk of plantain goodness. We usually eat them as an appetizer or as part of a meal. Sometimes I think about making some just because the are wonderful. Normally - because of the double fry - they take a while to make, which leads to us only having them once and a while. Then one day - everything changed. Here is how: You start with plantains. Simple enough. If you can, try to find ones that are a good length - about 1 1/2 the length of a good sized banana and about 1 1/2 to double the width. 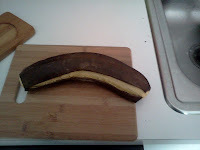 Cut the ends off and slice down one side of the plantain (just through the skin). 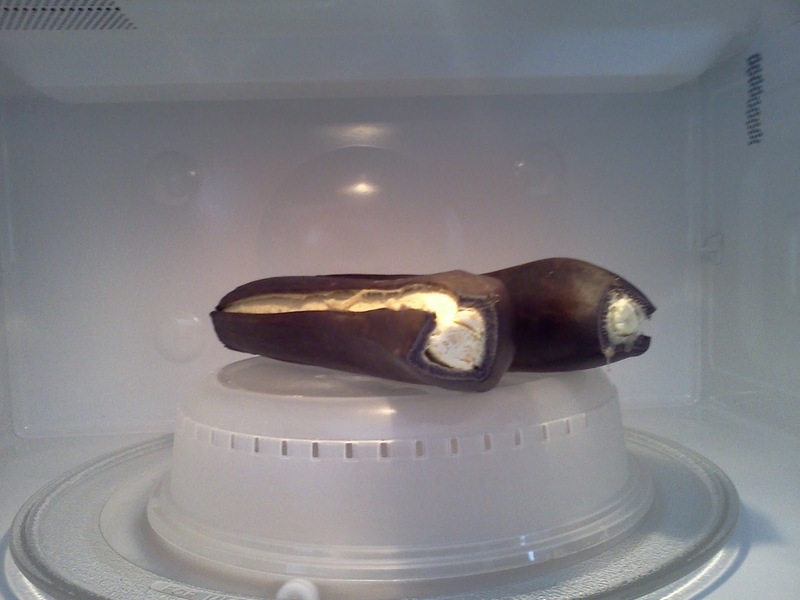 The next part, which was the real game changer, was the microwave. Yes, good ol trusty microwave. Instead of the first fry, take the whole plantain (I do two at at a time) and put them in the microwave - on high for about 7-8 minutes (for two). You can tell when they are done because the skin will go all black and they will be firm but tender to cut. If you don't think they are done, add a minute or so. It all depends on your microwave! Next, before you get into dealing with the plantains, take a few minutes to do some prep. 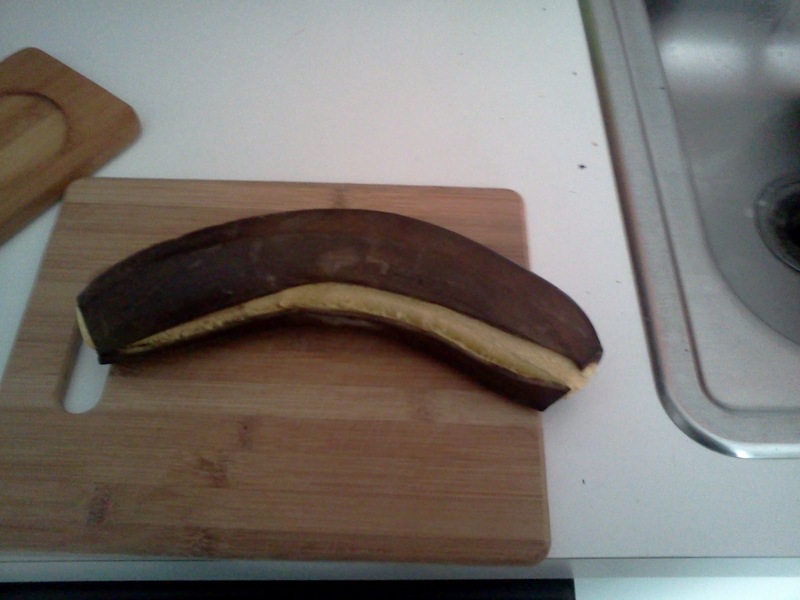 For that I mean, what are you going to use to flatten the plantain. 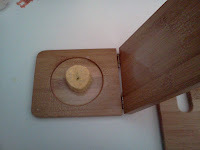 There is a kitchen gadget called a Tostonera. It's sole purpose in life is to make tostones. I am usually not a fan of unitaskers in the kitchen (thanks Alton Brown) but I make an exception for this baby. I use it a lot and it was cheap. Plus I always figure there may come a day when I saves my life from a giant spider (you never know). 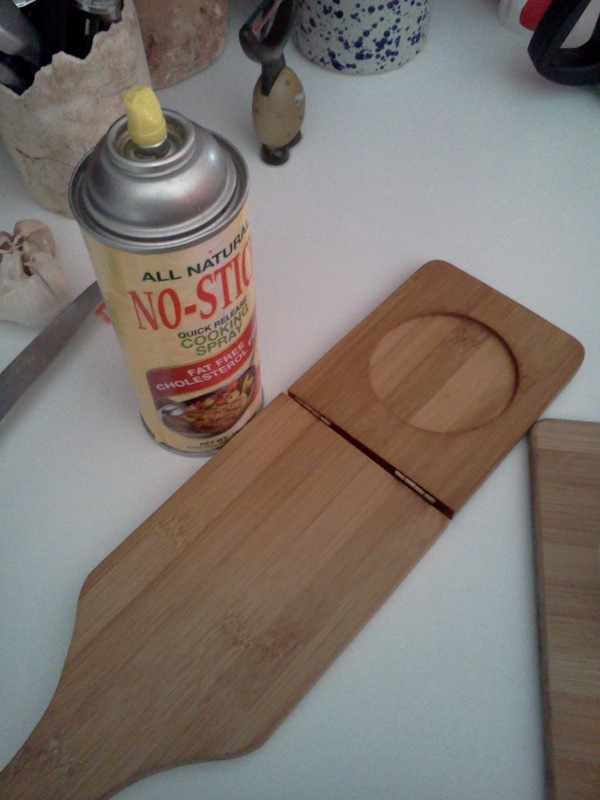 If you don't have one - which is fine - have a cutting board and an object with a flat bottom that you don't mind getting dirty. The next thing you want is non stick cooking spray. I had never thought of using it before my mother-in-law told me, but now, I will never make them without. It really really REALLY makes a difference! After that comes the my least favourite part - pealing them. This is mostly because they are hot. You need to get that heat to flatten them so you want to work quickly - but not so quickly that you burn the crap out of your hands. 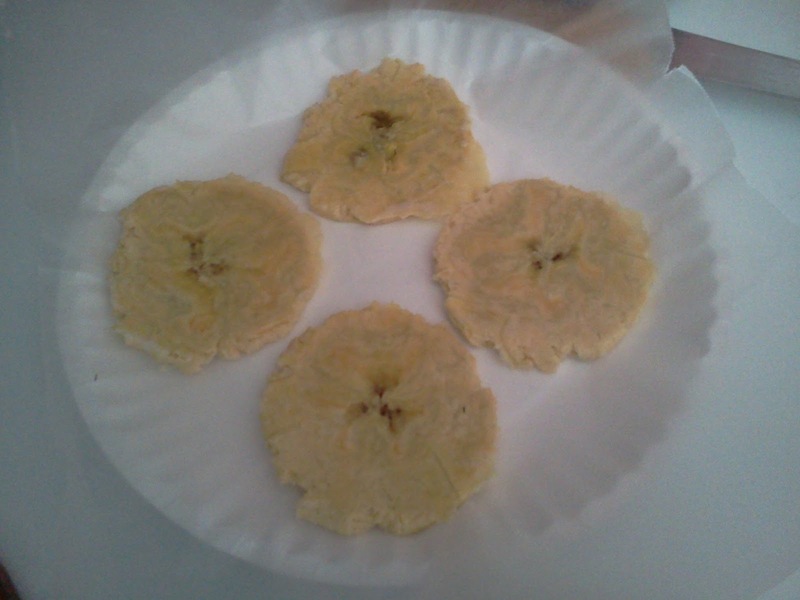 When I make tostones now I am usually making a ton of them (I press them and then freeze bags at a time) So I usually peal, cut and press while I have the next two cooking. 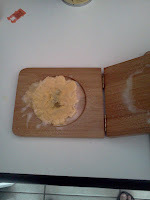 To remove the peal it helps me to hold the plantain with a kitchen towel or a fabric pot holder, just to take the heat. Then I use a knife to help pop the plantain from the skin. After you get into the groove it becomes easier. It helps that your initial slice through the skin will pop open and give you good access. On another note - at this point the membrane on the inside of the plantain skin can stain your clothes, so try not to get it on you. After the peal is off you want to cut it into pieces. This all depends on how big you want your final product to be. You are looking at about 1 inch segments - but if you have a really thick plantain you may want to make them smaller so they are not gigantic. 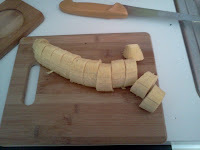 I usually average about a dozen cuts per plantain. Next, take your Tostonera (or other flattening combo) and give it a spray from the non stick can of goodness - remember to do both sides. Then place your piece of plantain in the center and give it a good press. We are not looking to smash the crap out of them (bad Hulk) but to give it enough pressure to gain a plantain patty that is about 1/8th of an inch. Then simple remove the plantain from the devise with a small spatula and place on a plate til your ready to either freeze them or cook them! Keep going until you have pressed all your pieces. And Voila! You are done..with the prep anyways.. which is really the "difficult" part. Next to enjoy you just want to fry them in some oil til they turn golden brown, which only takes a few minutes. You can eat them as is, or with ketchup, or my personal favourite - 1 part ketchup, 1 part mayo, and about 1-2 cloves of garlic - grated, minced or pressed (I really like garlic). Just be sure to give them a light sprinkle of salt out of the oil and enjoy! Until the next timbit of deliciousness!